Learn how to become a medium with me. I am a natural medium, clairvoyant and clairaudient. I use my abilities as a mediumship teacher to help people evolve and awaken to their own psychic abilities. My life has definitely been extra-ordinary. As far back as I can remember I have always been able to see the energy fields surrounding people and inanimate objects and hear spirit voices. My childhood was full of fun! I would play games like hide and go seek with my spirit friends, but now as an adult they give me great insight and guidance which I enjoy sharing with others. In my early twenties, I discovered I could trance-channel spirit. This is where I allow the spirit to borrow my body and voice to communicate and relay messages to others. I have been giving readings publicly since 1991. Growing up with these abilities was definitely different, however there were some perks. I was never alone, think about it, I was never alone…so it was essential that I had to learn how to control my abilities. It only took two years to figure it out. I was 23 before I could manage my abilities out in public without feeling like I was crazy. This was exciting for me and gave me the encouragement to study the ancient Tibetan healing art of Reiki. I received the status of Reiki Master four years later in 1996. As well as a bachelor’s degree in Fine Arts from the University of Florida. I earned a Massage and Hydro-Therapy certification in 1998 from the Florida School of Massage before relocated to Atlanta where I live today. While working as a massage therapist and energy healer, I wanted understand their physical bodies and assist them with their healing using Reiki, but I noticed some issues would not heal. These kind of wounds were usually not of this lifetime, so in 2000, I received a Master Hypnotherapist degree and extended this education with an intensive past life regression program with Dr. Brian Weiss, MD. Already working worldwide with my readings, I decided to launch a company in 2001, Love and Light LLC, designed to support, create, and inspire spiritual growth through public channeling, guest lecturers, classes and private sessions for all ages. To better understand the communities needs I began the guest lecture circuit at Colleges and Universities, and became a frequent presenter for groups and radio shows throughout the US and around the world. This encouraged me to speak up and write my first book, With Love and Light: a true story about an uncommon gift. Click here to listen to a two-part interview I did about my book with Brian Mercer of Author Magazine. My company was growing and I wanted to offer a space where everyone could feel comfortable coming to learn more about themselves. 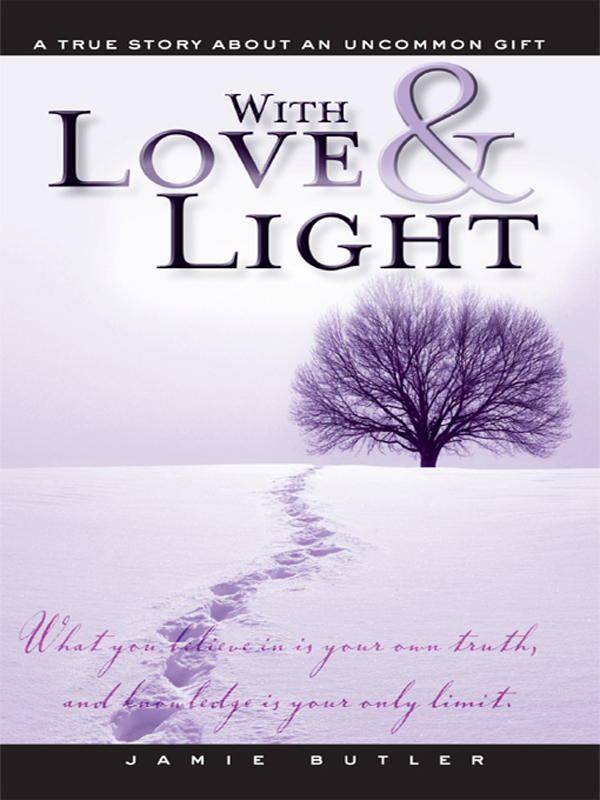 In 2011, I create The Center for Love and Light. The Center continues to evolve and now hosts teachers, healers and lecturers from all over the globe. It is a wonderful place for me to call home. Because teaching is a passion of mine, I also decided to design an all-encompassing Love and Light Chakra Reference chart that I currently sell through my website. With this handy tool there is no need to carry around a book, since all you need to know is in one easy-to-read chart. I’ve also produced some very short videos titled Happy Monday Luminaires! on different topics that are available on YouTube. All of this great teaching and traveling inspired me to be the co-founder of The Love and Light Institute, a nonprofit learning environment connecting the mind, body, emotion and soul to cultivate the potential from within. We offer low cost and free tickets to classes and events to our community online and in person in Atlanta. I have thoroughly enjoyed watching the Love and Light community grow and blossom into what it is today. My latest venture, The Lighter Side Network, has opened my eyes to the wonderful world of producing! My Network is where the everyday meets the extraordinary. I am very proud of how every show on the Network is funded by viewers which supports The Lighter Side Network to put out content that is straight from the source and not influenced by corporations, ads or product placements. I host one of the shows, The Lighter Side Show, which encourages learning truths through humor while letting go of learned behavior. My life goal is to teach people of all ages about the infinite possibilities for healing and success available to us when wholeness living is incorporated into our daily lives and this is exactly what the Network is. Subscribe and join me on the journey. Remember Luminaires, It’s not Woo Woo, It’s True True. Join the mailing list to receive my monthly newsletter. © Copyright 2019. Jamie Butler. The Everyday Medium All Rights Reserved.